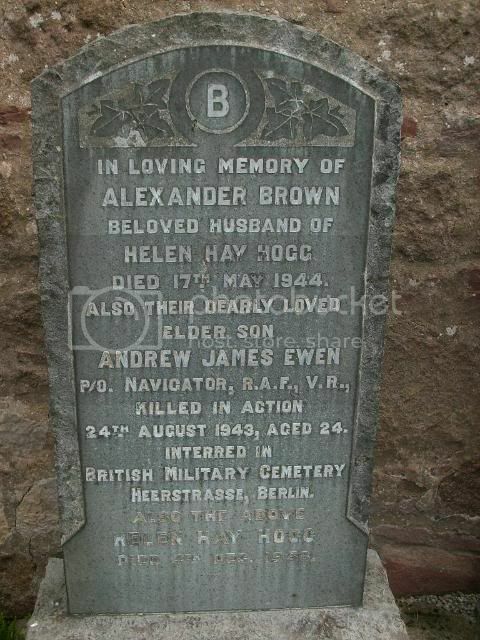 Additional information: Son of Alexander and Helen Hay Brown, of Haddington, East Lothian. Grave/Memorial Reference: Coll. grave 5. L. 31-34. 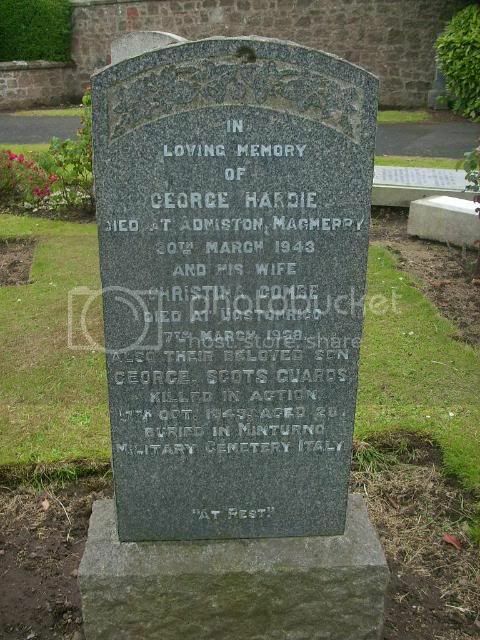 Additional information: Son of George and Christina Hardie. Grave/Memorial Reference: VII, B, 4. 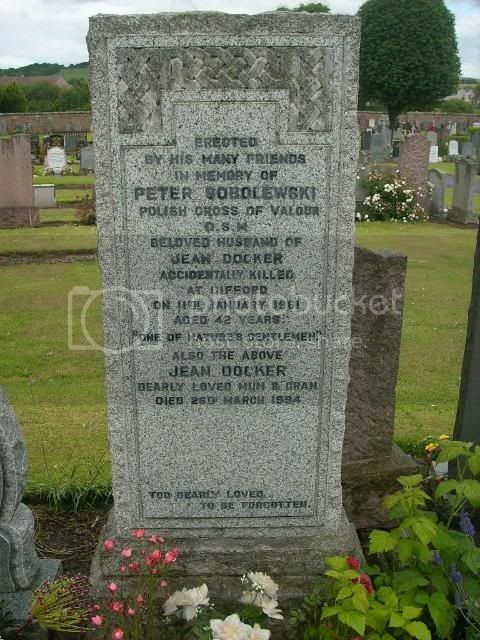 Additional information: Son of Jane Harkes, of Edinburgh. 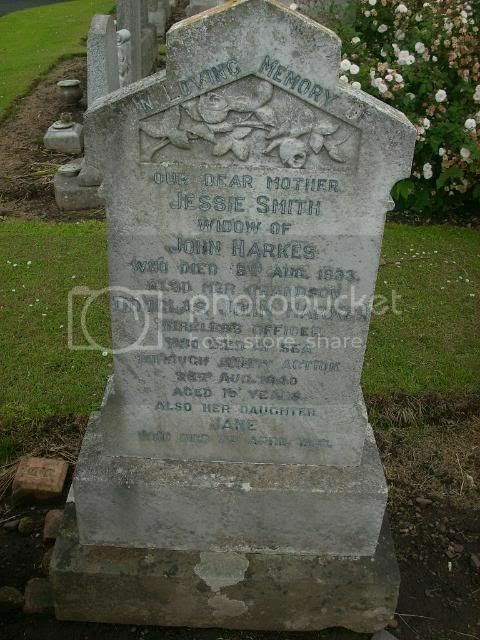 In loving memory of our dear mother Jessie Smith wodow of John Harkes who died 18th August 1933 also her grandson Douglas John Harkes wireless officer who died at sea through enemy action 29th August 1940 aged 19 years also her daughter Jane who died 7th April 1959. 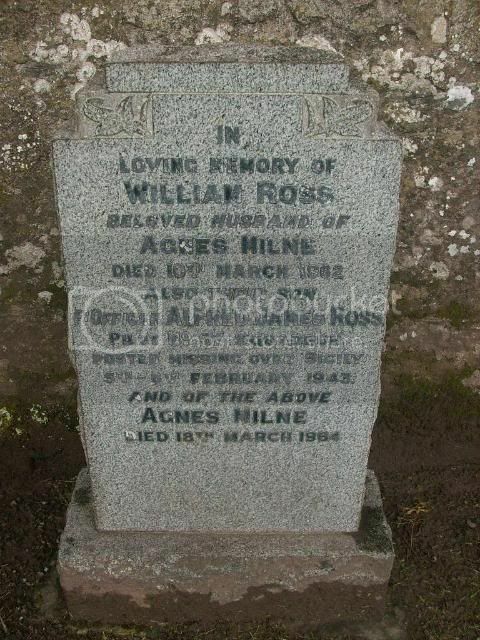 Additional information: Son of Henry Bain Hunter and Isabella Drysdale Hunter, of Portobello, Midlothian. Grave/Memorial Reference: III. C. 27. 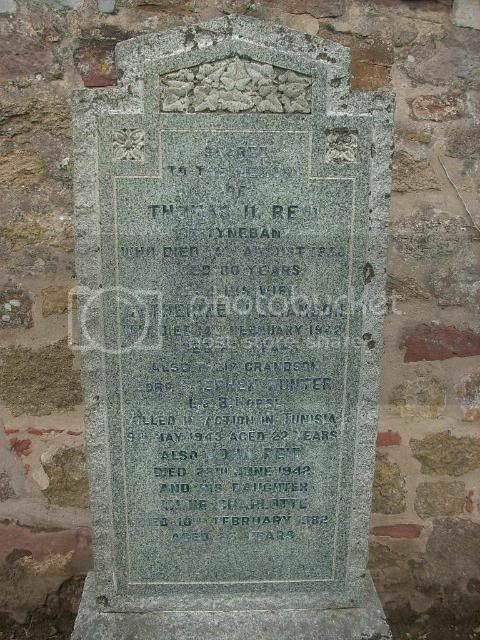 Sacred to the memory of Thomas D Reid of Tynebank who died 14th August 1938 aged 80 years also his wife Catherine Williamson who died 14th February 1942 aged 82 years also their grandson Corp Stephen Hunter L & B Horse killed in action in Tunisia 9th May 1943 aged 22 years, also John Reid died 28th June 1942 and his daughter Annie Charlotte died 10th February 1982 aged 83 years. 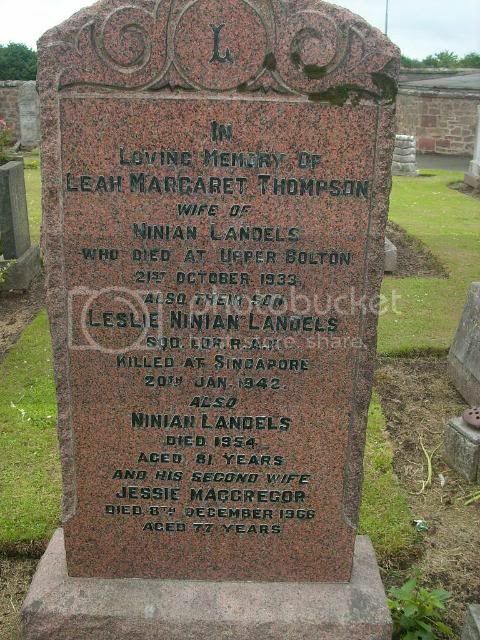 In loving memory of Leah Margaret Thompson wife of Ninian Landels who died at Upper Bolton 21st October 1933 also their son Leslie Ninian Landels Sqd. 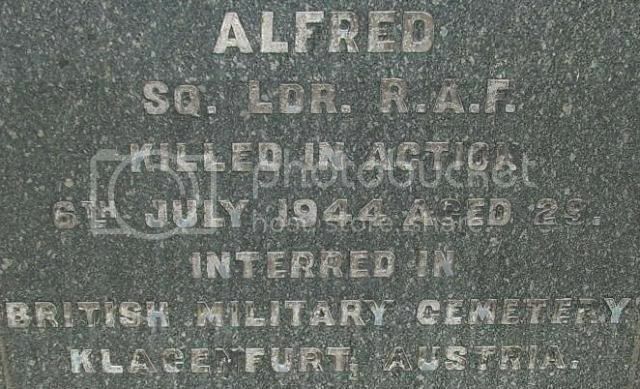 Ldr RAF killed at Singapore 20th Jan 1942 also Ninian Landels died 1954 aged 81 years and his 2nd wife Jessie MacGregor died 8th December 1966 aged 77 years. 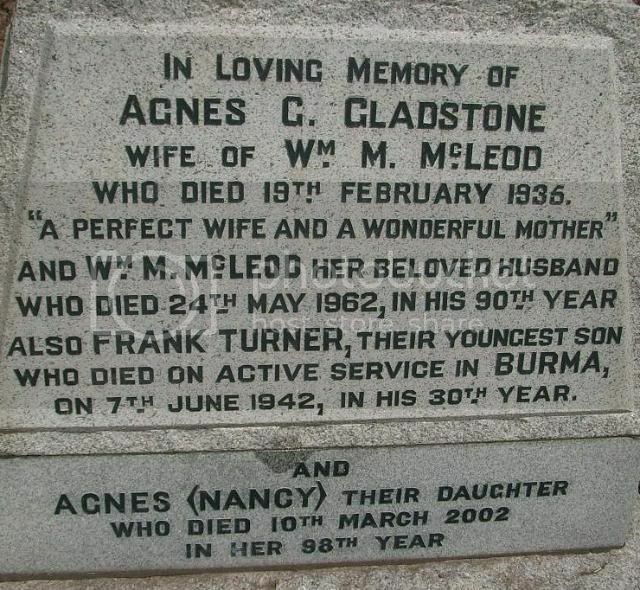 In loving memory of Agnes G Gladstone wife of William M McLeod who died 19th February 1935 "A perfect wife and a wonderful mother" and William M McLeod her beloved husband who died 24th May 1962 in his 90th year, also Frank Turner, their youngest son who died on active service in Burma on 7th June 1942 in his 30th year and Agnes (Nancy) their daughterwho died 10th March 2002 in her 98th year. 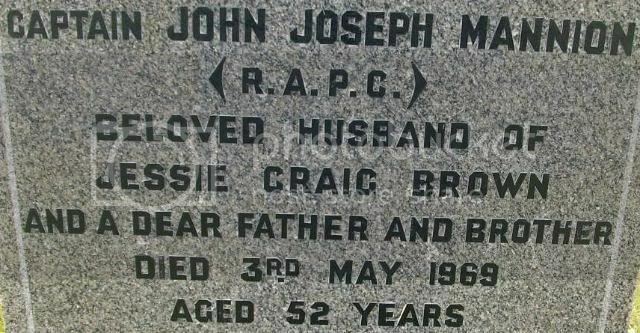 Additional information: Son of Alexander Moffat and of Mary Moffat (nee McDonald); husband of Christina T. W. Moffat (nee Primrose), of Portobello, Midlothian. 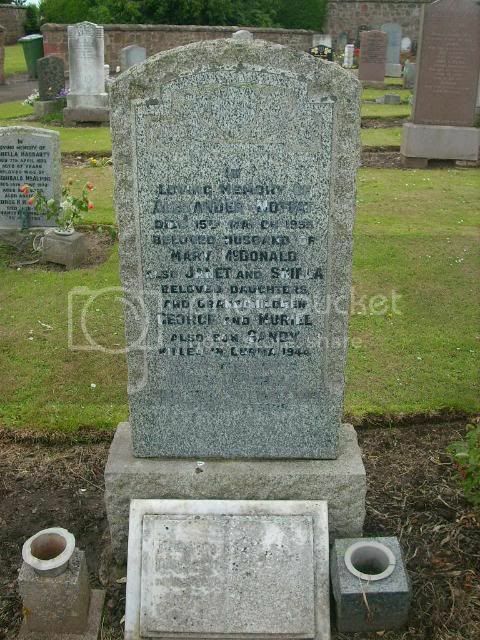 In memory of Alexander Moffatt died 15th March 1955 beloved husband of Mary McDonald also Janet and Sheila beloved daughters and grandchildren George and Muriel, also son Sandy killed in Burma 1944 also the above Mary McDonald died 13th January 1969 aged 80 years. 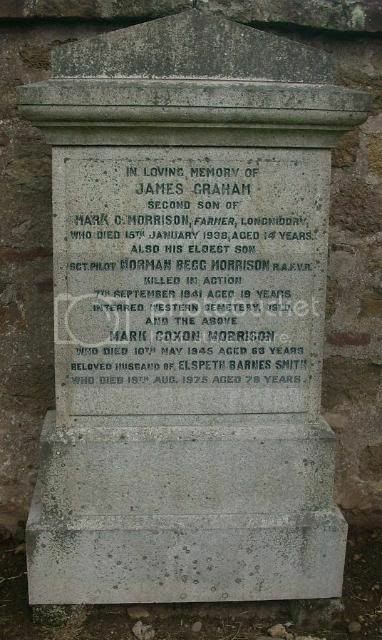 Additional information: Son of Mark C. and Elspeth B. Morrison, of Longniddry, East Lothian. Grave/Memorial Reference: 1. C. 5. 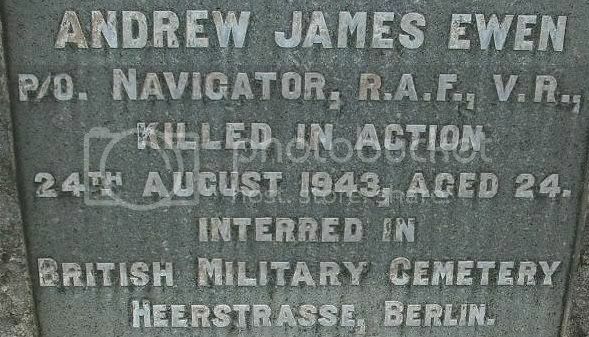 Additional information: Son of James Sandilands, and of Margaret C. R. Sandilands, of Gifford, East Lothian. 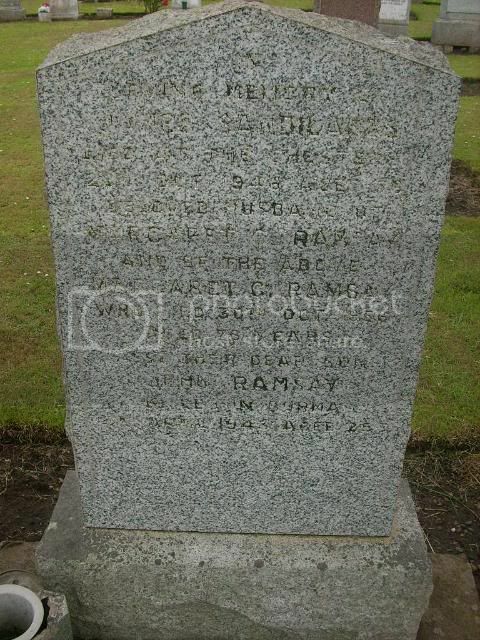 In loving memory of James Sandilands died at The Chesters 29th October 1946 aged 75 beloved husband of Margaret C Ramsay and the above Margaret C Ramsay who died 30th October 1956 aged 76 years also their dear son John Ramsay killed in Burma 3rd April 1943 aged 25. 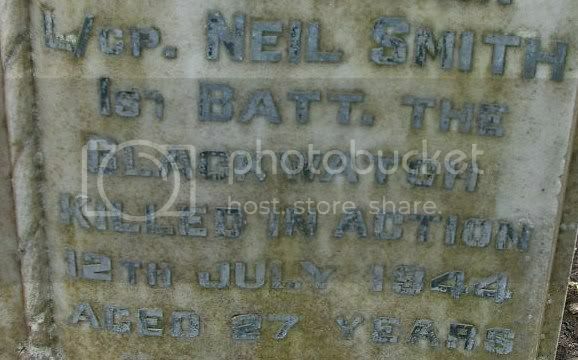 Additional information: Son of Tommy and Sarah Smith, of Glasgow; husband of Jeanie Smith, of Balornock, Glasgow. 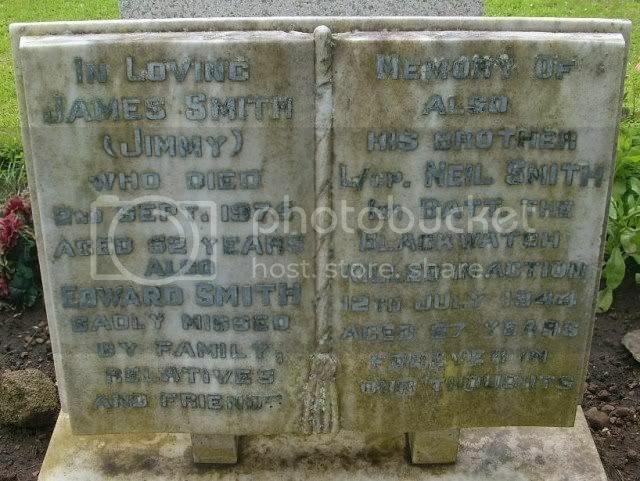 In loving memory of James Smith (Jimmy) who died 2nd September 1975 aged 52 years, also Edward Smith sadly missed by family, relatives and friends also his brother L/Cpl Neil Smith 1st Batt The Black Watch killed in action 12th July 1944 aged 27 years. Forever in our thoughts. 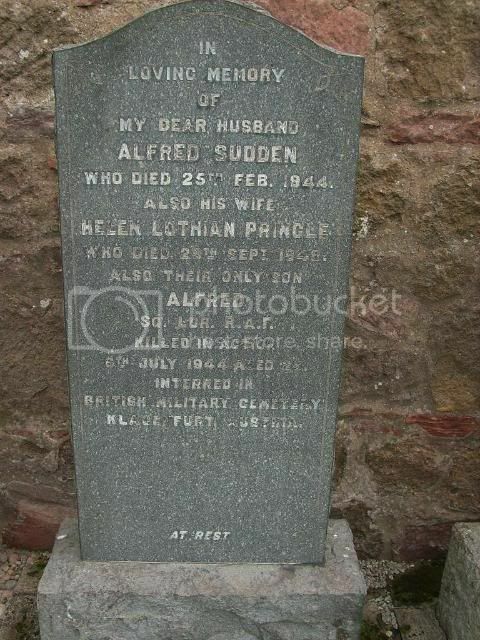 Additional information: Son of Alfred and Helen Lothian Sudden. 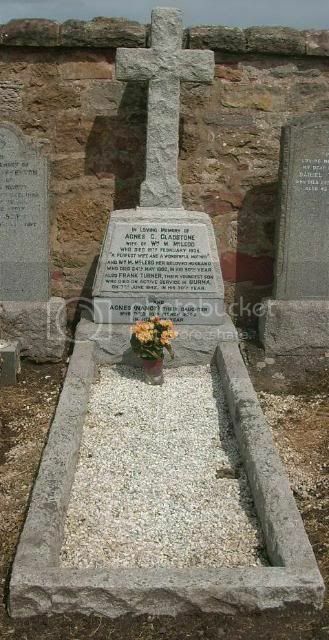 Grave/Memorial Reference: Coll. grave 8. A. 9-10. 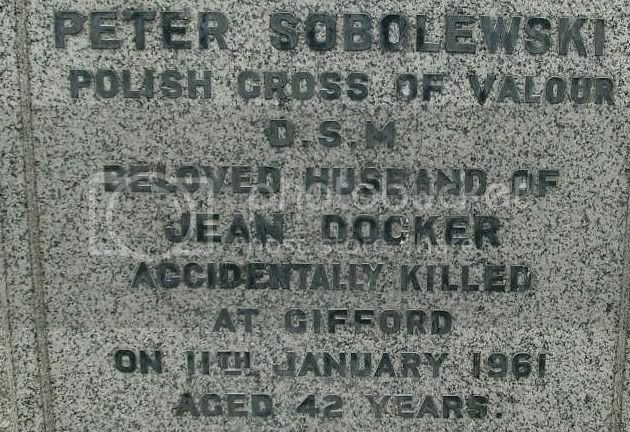 Erected by his many friends in memory of Peter Sobolewski Polish Cross of Valour DSM beloved husband of Jean Docker accidentally killed at Gifford on 11th Januray 1961 aged 42 years "One of nature's gentlemen" also the above Jean Docker dearly loved mum and gran died 26th March 1994. 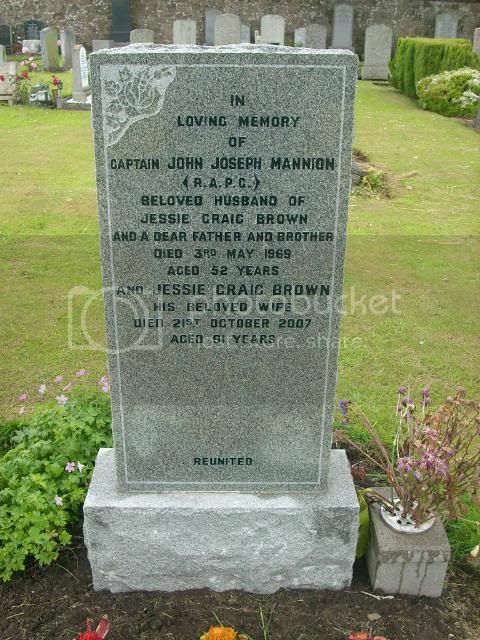 In loving memory of Captain John Joseph Mannion (R.A.P.C) beloved husband of Jessie Craig Brown and dear father and brother died 3rd May 1969 aged 52 years and Jessie Craig Brown his beloved wife died 21st October 2007 aged 91 years.